Newark, NJ – August 1, 2018 – Mayor Ras J. Baraka and Director of Water and Sewer Utilities Andrea Adebowale announced today that the city of Newark has completed the “Queen Ditch Restoration Project” on Frelinghuysen Avenue, a $5.3 million culvert to end 30 years of flooding on Frelinghuysen and Meeker Avenues in the South Ward that results when heavy rain impacts these arteries. 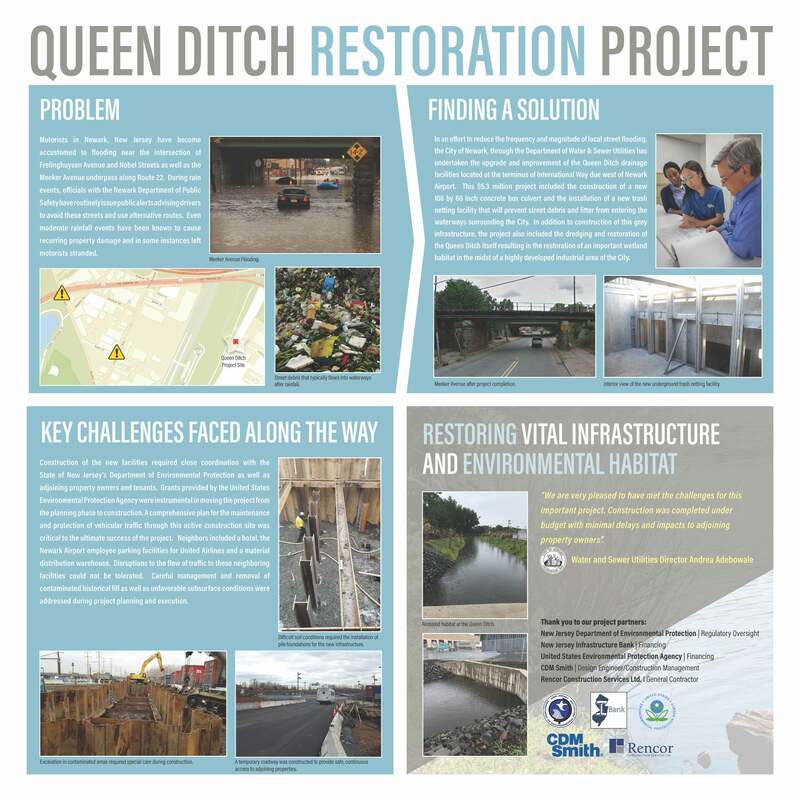 The project, a partnership with the State Department of Environmental Protection, New Jersey Infrastructure Bank, and the U.S. Environmental Protection Agency, created a new 60 by 108-inch concrete ox culvert and trash netting facility that will prevent street debris and litter from entering the waterways surround the area, and dredged and restored the drainage facilities called the “Queen Ditch.” The project also restored a wetland habitat in this highly developed industrial area. “For nearly three decades, heavy rain has turned these portions of Frelinghuysen and Meeker Avenues into lakes, creating safety and health hazards for drivers and residents alike. Thanks to hard work by our contractors and excellent partnerships with state and federal agencies, we will no longer have to endure the spectacle of sunken cars on Frelinghuysen Avenue and first responders rescuing them in rubber rafts. We will gain a safer, cleaner, and stronger South Ward from this project,” Mayor Baraka said. The areas addressed were the intersection of Frelinghuysen Avenue and Nobel Street as well as the Meeker Avenue underpass along Route 22. During heavy rainstorms, these arteries have often become flooded, forcing the Newark Department of Public Safety to issue traffic advisories to motorists to use alternate routes, creating traffic jams. Some vehicles and their occupants have been caught in the flooding, which has required the department to send in first response rescue teams to save these persons. In addition, the flooding causes property damage to local buildings. Construction of the new facilities required close coordination with the state Department of Environmental Protection as well as adjoining property owners and tenants. Grants provided by the US Environmental Protection Agency were instrumental in moving the project from the planning phase to construction. A comprehensive plan for maintenance and protection of vehicular traffic through this active construction site was critical to the ultimate success of the project. Neighbors included a hotel, the Newark Liberty International Airport employee parking facilities for United Airlines and a material distribution warehouse. Disruption to the flow of traffic to these neighboring facilities could not be tolerated. Careful management and removal of contaminated historical fill as well as unfavorable subsurface conditions were addressed during project planning and execution. “We are very pleased to have met the challenges for this important project. Construction was completed under budget with minimal delays and impacts to adjoining property owners,” said Director Adebowale. The design engineer and construction manager was CDM Smith, and the general contractor was Rencer Construction Services Ltd.